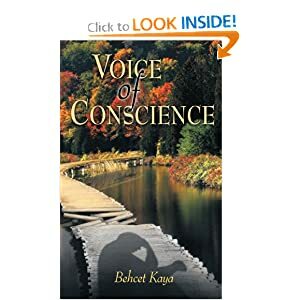 About the BookVoice of Conscience , by Behcet Kaya, catches the reader’s attention from the first letter written until the final period of the book without letting go. His descriptive prowess for weaving his story takes the reader from locations in exotic Turkey to London and then to America. The story begins with Ramzi Ozcomert in Turkey for the wedding of his sister, Erin, and her fiancée, Turkel, but a rival family has other ideas. The head of the Korucu family has decided that his grandson is the man that should be marrying the beautiful Erin. However, when Ramzi’s father rejects the offer, it is taken as an insult to the Korucu’s. On the night after the family livestock has been mutilated, Ramzi is awakened to find out that his father, mother, and sister have been murdered in their sleep. Ramzi tries to pull his life together but suffers from the memories ofwhat happened to his family and fears that the same fate awaits him. He escapes to London where he starts a new life, studying to become an engineer. It is while he is there that he meets a wealthy American named Megan. The two fall in love, get married, move to the United States, start a family of their own and build a very successful business. This is not enough for Ramzi, as deep in his heart he still wants revenge for what happened to his family on that fateful night. The burning desire to avenge his family systematically begins to destroy everything that he has worked so hard to build for himself. This epic novel has rich character development with witty and clever dialogue. Kaya’s description of the settings in this story make you feel as though you are walking hand in hand with the characters. This tragic tale is the first novel by Behcet Kaya, but it will leave readers waiting with baited breath for his next novel to be published. This book opened my eyes to a country and to customs that I did not know much about in the past. This book provides so many insights into these areas and allows the readers to explore and understand where people of this culture are coming from and even some of the mores and traditions that surround the country itself. The book is powerful and could evokes strong emotions from readers. I was impressed that this was a first novel, and if this is any indication of the future, there is much to expect from this writer in the future. The story itself was well written and engaged me as a reader. I found the reading to go smoothly and that I did not want to stop reading once I started. The characters that were presented were strong and vivid and you get to truly know and understand them as you read further into the book. A great book that I would recommend to all!